Myrtle Parkin and Ben Butler jr. were married in Washburn, IL in 1895. Here they raised three daughters. 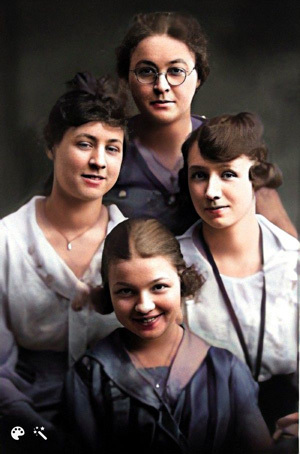 The accompanying photo was taken about 1917 and shows Myrtle (top), Dorothy (left), Madeline (right), and Lois (bottom). Ben Butler jr, one of 10 children, was born in Washburn, as well as his wife Myrtle and their daughters. Ben worked as a brick mason and contractor who built structures throughout central Illinois and adjoining states. During the early 1900"s the family moved briefly to Minonk where the girls attended school. The family then moved to Chicago where Myrtle operated a pastry store while the girls attended high school. Dorothy graduated in 1916 and continued in a teachers academy where she obtained a credential. She taught briefly in Southern IL.